A prominent characteristic of the city of Toronto is its increasing diversity, with half of the city’s population being foreign-born. While the concept of diversity appeals to Toronto’s reputation as a multi-cultural haven, the city’s approach to managing diversity is becoming increasingly instrumentalist, i.e. diversity is considered an asset as long as its benefits are economically valuable. As a result, inner-city neighbourhoods in Toronto are thriving due to development projects and services, while the most diverse neighbourhoods in the inner-suburbs are left in a dire state. This article presents an analysis of how the concept of diversity used within policy euphemises systemic discrimination and inequality based on race, class and gender. It serves to reveal the mismatch between policy rhetoric on diversity and its materialisation in the daily lives of the inhabitants of a low-income Toronto innersuburb, by juxtaposing policy discourses with inhabitants’ everyday experiences. By illustrating how inhabitants reproduce negative essentialised stereotypes based on diversity markers, the article argues that talking diversity as an alternative to or an escape from problematising the intertwined systems of race, class and gender oppression, could potentially serve to perpetuate them. Diversity has increasingly emerged as the core focus of many studies concerning factors impacting on social cohesion. Various scholars have concluded that diversity is detrimental to cohesion. Most of this research, however, draws generalisations based upon quantitative data and fails to account for the impact of inequality, segregation and discrimination, and their interconnectedness to diversity. This research provides an in-depth qualitative analysis of the perceptions of inhabitants of a diverse Toronto neighbourhood regarding formal and informal interactions, common values and attachment. The findings suggest that the internalisation of gendered and class-based racism by inhabitants plays a crucial role in shaping perceptions and interactions. Increasingly, public spaces are being regarded as important resources for fostering multi-cultural coexistence and for creating opportunities for cross-cultural understanding and dialogue, in that they can provide a platform wherein interactions across diverse backgrounds occur. This article explores the perceptions of public place in a highly diverse, post-war, modernist suburb of Toronto, and the extent to which public spaces play a role in fostering interactions between different groups and catering for diversity in the area. The analysis indicates that there is little evidence for encounters between diverse groups in public spaces, due to the lack of spatial infrastructure anticipated in the modernist design of the neighbourhood. In addition, social factors such as surveillance and policing, lack of appropriate symbols that cater to different user groups, and presence of gangs and violence have resulted in residents’ self-exclusion from public spaces and undermined the frequency and quality of their social encounters. The recent decades have witnessed a shift from the traditional top-down model of service delivery led by the state to the provision and delivery of services by community organisations. 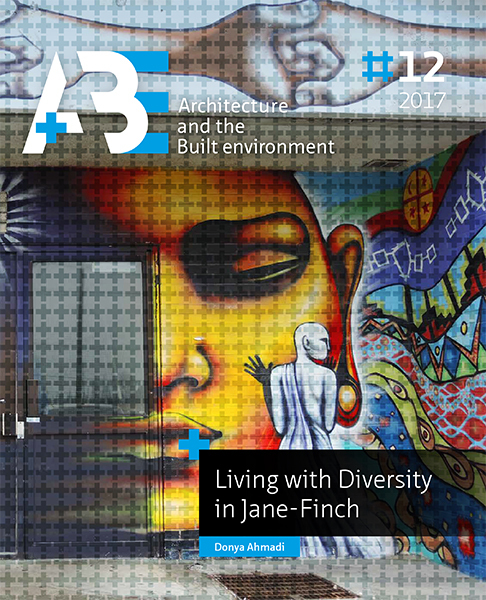 This article explores the extent to which community initiatives in Jane and Finch, a highly diverse, lower income, inner-suburban neighbourhood of Toronto, were successful in achieving their goals, and the relevance of the experience for current neighbourhood initiatives targeting diversity. It discusses the factors which contributed to the effectiveness of 10 analysed initiatives in terms of reaching their primary objectives. The analysis shows that despite the efforts within community initiatives to improve conditions for inhabitants, their impacts remain limited due to underlying structural challenges such as poverty and institutionalised racism, increasing fragmentation within the over-all network of initiatives and precarious funding, which pit programs against one another and hamper effective collaboration and solidarity needed in order to achieve transformative change. The starting point of this project was the ‘paradox’ in how the concept of urban diversity is evoked, in theory, in policy and in practice, as something which is simultaneously celebrated and demonised. Diversity is indeed a fashion word, it sounds celebratory, tolerant and harmonious, but not too confrontational (Essed, 2002). Diversity has gained popular appeal especially because it offers an approach that goes beyond ‘dated’ terms such as equality and anti-racism. Yet diversity workers often tend to experience this very paradox, working within organizations that claim to be committed to diversity but feeling as though they are ‘banging their head against a brick wall’ (Sara Ahmed, 2012, emphasis mine). The same paradox is evident in the manner in which the city of Toronto approaches its diversity. The premise that diversity is a strength which should be celebrated appears to be a popular notion within Toronto’s city policy and mainstream public discourse. Yet, Toronto’s most diverse neighbourhoods located at the edges of the city are scapegoated and criminalised. This is especially the tendency when ethnic, cultural and religious diversity coincide with poverty, welfare dependency and poor infrastructure. This study set out to provide empirical knowledge of what living with and working towards diversity in urban areas looks like. Specifically, it raised the question: How is diversity experienced at the neighbourhood level, as (a) discourse, (b) social reality, and (c) practice?? This question was broken down to four sub-questions which were investigated in four interconnected chapters (chapters 3 to 6). The present concluding chapter provides a summary of the findings of each empirical chapter and further discusses these findings in relation to one another. It closes with recommendations for both policy and future scholarship addressing diversity in our cities.